Produced and directed by Clint Eastwood, this movie is not an action packed thriller. It’s a drama. Covering roughly the 1930’s through the 1970’s, the scenes are in rooms with low light, often dark and mysterious. The dialog is either soft and hushed in personal conversations, or powerful and pointed when a speech was given, which means that you must pay attention or you’ll miss important pieces of the story. Leonardo DiCaprio plays J. Edgar Hoover, the first director of the Federal Bureau of Investigation from it’s inception under President Franklin D. Roosevelt to Richard Nixon. Those presidents, as well as Charles Lindburg, mobsters and gangsters, activists, union leaders,Bobby Kennedy and Martin Luther King, are all played in the movie too. 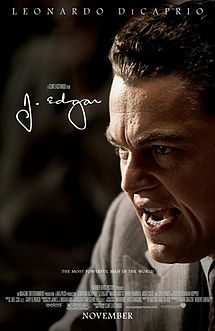 As J. Edgar Hoover, Leonardo does a tremendous acting job and was nominated for many film awards though he did not win any of them. It’s a shame too, because he wonderfully captures a young Hoover, mid century accent and all, through an aging and tired J.Edgar at age 72. The rest of the movie – the cinematography, the acting, the costume design and the historical elements – all come together in an excellent production and a great movie when you’re tired of fluffy romantics or action packed thrillers. This one is political, bureaucratic, constitutional, judicial, moral, patriotic and criminally thought provoking. This is a story of a man who built the FBI into a modern crime fighting agency using centralized fingerprinting and forensic laboratories. Later in his career though, critics claimed he overstepped the law by gathering information illegally and kept secret files on politicians, celebrities and activists. Information is power, and J. Edgar certainly wielded his power when he needed to. The movie does a great job portraying that. Give it a shot. Rent the DVD. It’s a great character study! This entry was posted in Books, Insights, Movies, Politics, Theater and tagged actor, Bureau, character, cinema, Clint, Clyde, costume, crime, Design, DiCaprio, director, dvd, Eastwood, Edgar, FBI, Federal, fingerprint, forensic, G, gangsters, Hoover, Investigation, J, Leonardo, makeup, men, movie, politics, rent, Tolson. Bookmark the permalink.